How Do Strava and MapMyRide Determine Cycling Climb Categories? As an avid pro-cycling fan, and particularly of the Grand Tours, I have always been fascinated by the classifications given to the climbs along the route. The sight of one or more Hors Catégorie climbs on the route profile for the following day’s stage means that I’ll have to clear my schedule for an afternoon spent glued to the television. But how do the climb classifications seen in the Tour de France or the Giro correspond to those that appear on our recently completed Strava or MapMyRide route? In this post, I aim to find out. Why do we have climb classifications? The concept of categorising climbs within the Tour de France was introduced to make the mountain points system more reflective of the relative difficulty of each ascent. From 1933 (when the mountains jersey was introduced) until 1947, riders were given the same number of points (10 for first over, down to 1 for the tenth-placed rider), irrespective of how high or how steep the climb. From 1947, climbs started to be graded by difficulty (with two categories initially, increasing to the present day five) and the awarding of points was adjusted accordingly (i.e. fewer points awarded to those riders first cresting the easier climbs). How do climb classifications work in general? As mentioned, the Tour de France features five categories of climb, ranging from hors catégorie (HC), the most difficult, then 1, 2, 3 and 4 (the easiest). Hors catégorie translates to ‘beyond categorisation’. It’s the catch-all classification for anything that is harder than a category 1. Historically it was used to describe a col that cars would not be able to climb. Given the number of skier-filled coaches that get up Alpe D’Huez (used 23 times as an HC climb in the Tour), that distinction no longer applies. Broadly speaking, the longer the climb and the steeper the gradient, the more difficult the climb is deemed to be, and it is graded accordingly. Overlaying this, when a climb features in a cycling race, the organisers look at where it comes in the route and potentially adjusts the classification. What might be a category 1 climb as the first col of the day, could become HC if it is set as the mountain top finish of a grueling Alpine stage. So how do Strava and MapMyRide classify climbs? Both apps use a methodology similar to professional bike racing, employing a formula based on a climb’s length and its gradient. A key distinction versus the Tour de France approach is that climbs on Strava and MapMyRide are classified on an individual basis, using terrain data. Classification is not influenced by where a climb features on a cyclist’s route. A cat 4 is a cat 4 whether you ride it straight out of the gate or at the end of a long hard day in the saddle. Strava is the most specific about how it goes about calculating a climb’s category. The length of the climb, measured in metres, is multiplied by its gradient, in per cent (for maths pedants, they use the ‘whole number’ per cent rather than the decimal, so 10% is 10 rather than 0.1). achieve a score of 8,000 or higher (so 1km at 8%; 1.5km at 6%; 2km at 4% etc). Again, for maths purists, the Strava site is a bit imprecise as to whether each threshold is a ‘greater than’ or a ‘greater than or equal to’ but I doubt it really matters (you’ve got to imagine there is a far greater margin of error on the terrain data used for the calculations). A Strava segment (a user-defined route section over which Strava users compete for the fastest time) is automatically given a classification if it meets the required climb criteria. If you are riding a route without defined segments, Strava will automatically determine if you cycled up a classified climb and create a segment for it. MapMyRide is less explicit in how it calculates the classification of a climb. In addition to the length of the climb and its average gradient, MMR’s calculation also takes into account “maximum elevation”, although it’s not clear whether this latter variable refers to height gained (students of Pythagorus can debate whether this is necessary) or final altitude (and could thus factor in the difficulty of performing in thinner air). MapMyRide has one more (easier) climb category than the Strava/pro-cycling model. This category 5 classification alone is probably sufficient to blot MMR’s copybook as far as most deluded pro-tour wannabes are concerned (note: I count myself amongst that number), as is their statement that, “[MMR’s] methodology is unique in several ways to allow for categorizations to be relevant for all sports…”. In other words, if you’re a cycling purist, you’ll probably prefer Strava. If you’ve already read my comparison of Strava and MapMyRide, you’ll know that I am already a huge fan of Strava. (If you haven’t read it, you should). Having looked at their respective climb classification methods, my preference for Strava seems increasingly justified. The calculation is clearer (i.e. they say what their methodology is) and it is not sullied by whatever adaptations MapMyRide make for the benefit of walkers and runners. That said, I’m sure an HC on MapMyRide is just as painful as one on Strava. I would love to hear your experiences with Strava and MapMyRide. Which is the hardest category climb you’ve found near you (the ones nearest me all seem to be 3s and 4s)? Let me know in the comments below. If you use Strava (or you’d like to), then you probably need a Garmin bike computer (who doesn’t need a Garmin?). If you’d like to find out which Garmin Edge is the right one for you (or to check if you’re current one is up to the task), click here to read my gi-Garmin-tic post on the subject. Garmin Edge 510: What’s In The Box? Pingback: Best cycle app: Strava or MapMyRide? 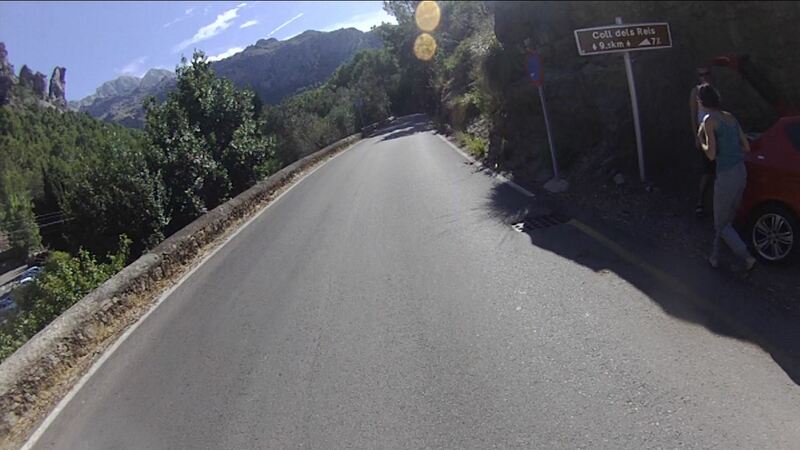 New post on my blog: how mountain climbs are classified on #strava and #mapmyride. It’s good – honest! http://t.co/ZATXm4Fa3R please RT! It gives everything a category of 4 apart from Box Hill which was by far the easiest climb out of the 5! Leith Hill (which I found pretty tough) is only a 4! I was really surprised how easy Box Hill was. It’s a while since I’ve done it (last year) and I remember how hard it was the first time I did it. Barely noticed it was a hill at all this time! I’m afraid to say it Giles, but it probably reflects the fact that climbs in the south east of England (as well as much of the rest of the UK) are just not as long or go as high as those on the continent. If you see a sign that says 9.5km at 7% (like this one), then (if you’re compos mentis) you can work out that the Strava points score is 66,500 (and therefore a Cat 1). Alternatively, if you know the height is 668m then, as you say, multiply it by 100 (and confirm that the average gradient is greater than 3%) and you’re at pretty much the same points score. Hi, I’m confused about the criteria for a climb to be rated on Map My Ride. The MMR website says for a climb to be categorised it must have an average gradient of 3% or greater and be at least 500m long. However, the 3% rule does not seem to be applied – see for example the route at this link where none of the climbs have a gradient of 3% or greater http://www.mapmyride.com/ie/swords-l/103-83-kilometer-bike-ride-on-feb-4-2012-route-67552364 . It is shown as having 5 categorised climbs. Have I misunderstood something here? This post is quite a bit after the fact, but I did a ride today that ascended 755 feet in .9 miles. The data was logged with Map My Ride. So first, I am over the 500m threshold. That’s a 15.8% grade (this was a mountain bike trail in Colorado). Map My Ride didn’t qualify it as a hill climb at all. According to MMR “For any climb to be rated (receive a climb score/category) it must be at least 500 meters in length with an average grade of 3% or more.” They also account for final elevation – I wound up at 7100 feet. MMR continues ” All other climbs that do not meet the criteria for HC to Cat 5 are simply too small to rate and can usually be crossed easily by bicycle, running, or walking.” I would by no means consider my ride easy. Before that .9 mile stretch I had already ascended 500 feet in 1.2 miles. Yes it was very short, but it was brutally uphill – AND it qualified for MMR by being over 500m in length. So what gives? When I started using Strava, the programme did not record all the routes etc and I also had problems with the thing closing down before finishing my ride. No matter how many times I queried the problems with Strava they were quite unhelpful – so I switched to Map my Ride and whilst I had a few issues, all these were answered with simple explanations and have been on that system ever since and it’s the Free version. I am sure “each to their own” but I am quite happy with my MMR. I also prefer MMR. It is more user-friendly for This user! I did like Strava’s Beacon Text, but now that I use Life360, I don’t really need it. Personal preferences vary quite a bit. If a product, or app doesn’t deliver what you need, it isn’t really superior, it’s just another option. I second that … I tried Strava for a day but quickly dumped it, I find MMR much, much, much easier to use. Better overviews, less clutter with functions I don’t use, quicker to do what you need. That’s all well and good, but as a MapMyRide user I’ve tried out Strava after reading your article and I was seriously disappointed by its UI and usability. Both the app itself and the accompanying website for MapMyRide are IMO *way* easier to use and provide a better and more clear overview of my workouts/activities … with Strava I spend more time clicking around, getting confused, and still not getting what I’m looking for than with MapMyRide. Strava’s UI is full of features that I’m not interesting in using but which take front stage over the ones that I do want to use. I’m not commenting on the accuracy, but I suggest that Strava’s UI/UX designer takes a class from MapMyRide’s designer. And by the way, Strava identified my “small” climb at the beginning of my ride (without showing any climb classification …) but ignored the much bigger and steeper one at the end … weird. For some unknown reason MapMyRide sometimes identifies the (complete) climb and sometimes doesn’t, on the same route, but at least this time it got it more or less right (only it included a virtually flat stretch at the beginning, which made the whole climb look much less steep than it actually is).